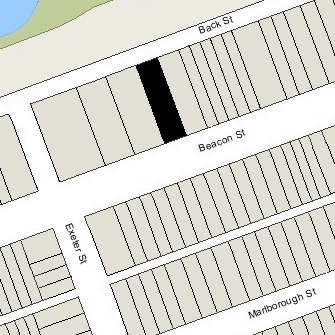 266 Beacon is located on the north side of Beacon, between Dartmouth and Exeter, with 264 Beacon to the east and 270 Beacon to the west. 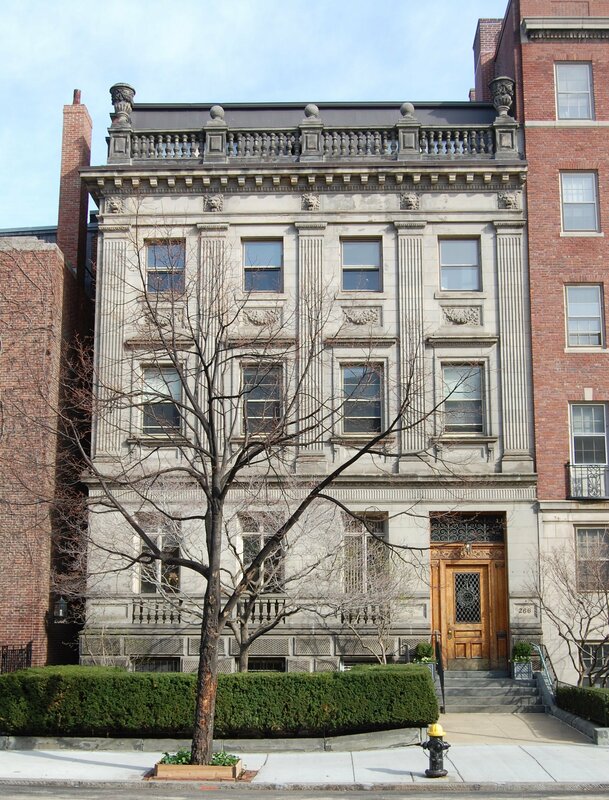 266 Beacon was designed by Shaw and Hunnewell, architects, and built in 1886 by L. Willcutt and C. E. Clark, as the home of dry goods merchant Francis Skinner and his wife, Eliza Blanchard (Gardner) Skinner. They previously had lived at 200 Beacon. Eliza Skinner is shown as the owner of 266 Beacon on the original permit application, dated December 29, 1885. Eliza Skinner purchased the land for 266 Beacon on October 3, 1855, from a trust established by Nathaniel Hooper for his benefit and for the benefit of his children. The lot was the western 40 feet of a 100 foot parcel the trust purchased on April 5, 1867. Nathaniel Hooper had built 262 Beacon and 264 Beacon ca. 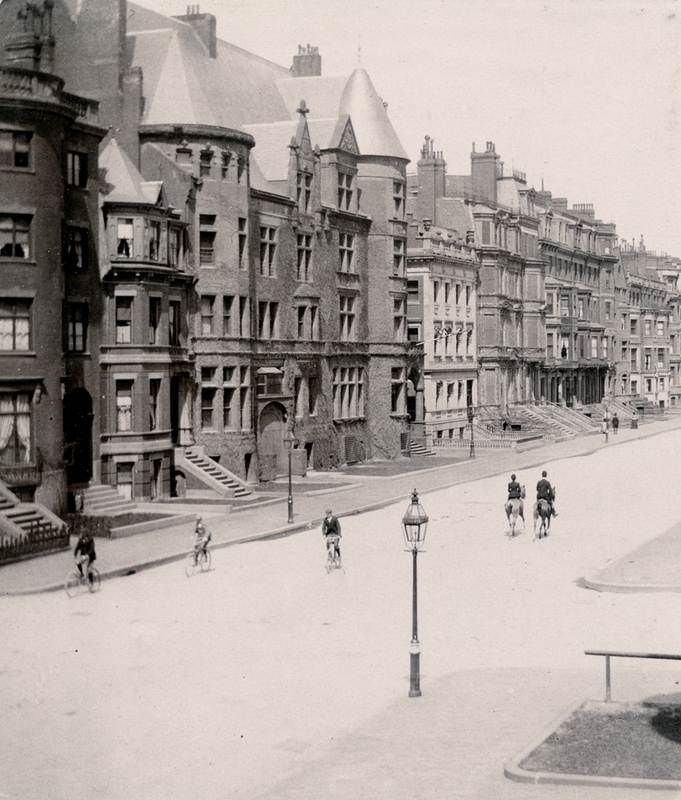 1872, making his home at 264 Beacon and leaving 266 Beacon as an open lot. The land was part of a larger parcel that had changed hands several times; it originally had been purchased on December 15, 1863, from the Boston and Roxbury Mill Corporation by attorney John Duncan Bryant. Click here for an index to the deeds for 266 Beacon. Eliza Skinner died in September of 1898. 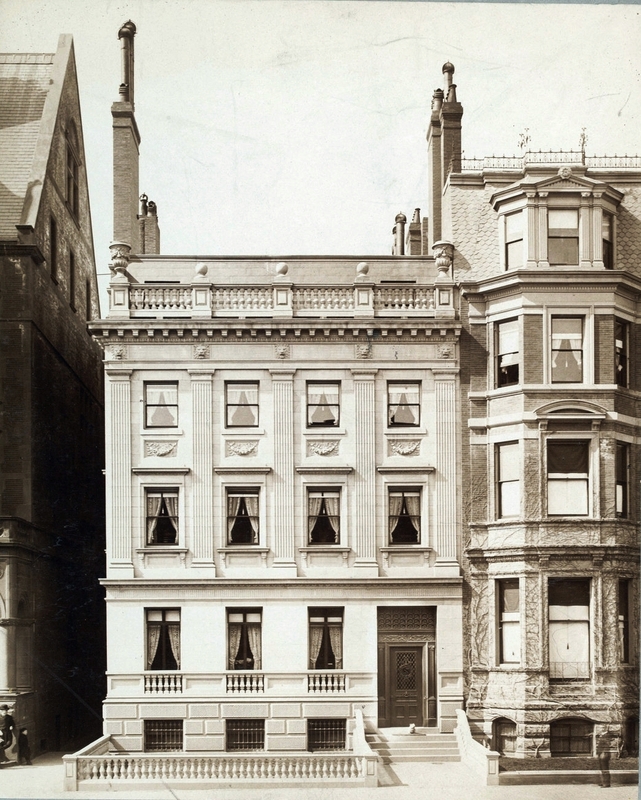 Francis Skinner and their son, Francis, Jr., continued to live at 266 Beacon. Francis Skinner, Jr., married in June of 1900 to Sarah Jane E. Carr. After their marriage, they lived in Dedham. Sarah Carr was a saleswoman in a store on Boylston and her father was a tailor, and the marriage was reported in the Boston Globe on July 20, 1900, under the headline “Society Agog, Aristocratic Youth Weds a Salesgirl, He is Nephew of Mrs. ‘Jack’ Gardner, She the daughter of a tailor.” Francis Skinner, Jr., died in May of 1914, and an article on his death (aboard the SS Coronia) noted that “Mr. Skinner’s father, with whom he then lived, and various relatives were much opposed to the marriage…” but “three years after the marriage, the breach between the young husband and his father became healed.” Sarah (Carr) Skinner married again in 1917 to attorney Charles Andrew Shea. 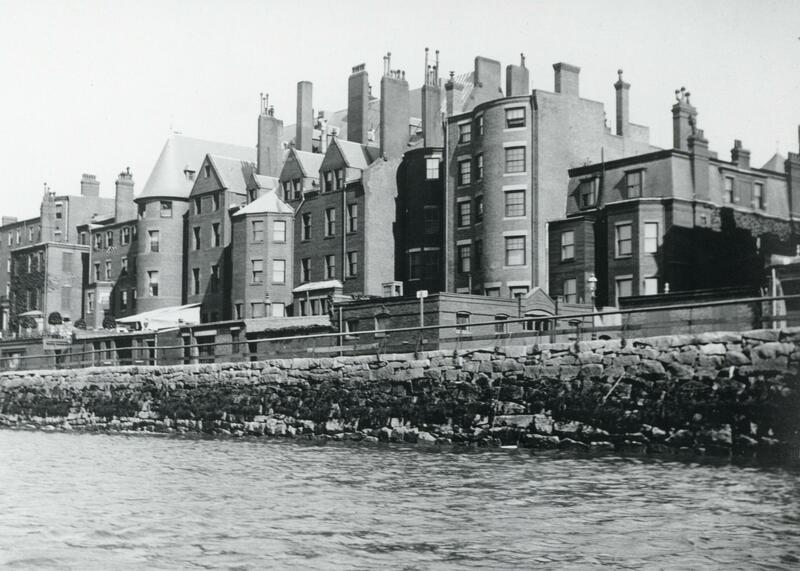 Francis Skinner, Sr., continued to live at 266 Beacon until his death in November of 1905. On September 19, 1907, 266 Beacon was purchased from Francis Skinner, Jr., by Robert J. Edwards, a bachelor. He previously had lived at 55 Bellevue in Roxbury. Living with him were his sisters, Hannah Edwards and Grace Martha Edwards. They also maintained a home in Beverly Farms. Robert Edwards was treasurer of the Edwards Manufacturing Company, cotton mill operators. He and his sisters were the children of textile manufacturer and banker Jacob Edwards and his wife, Juliana (Cheney) Edwards. On September 23, 1909, Robert Edwards transferred one-third interest in 266 Beacon to each of his sisters. Robert Edwards died in November of 1924. Hannah and Grace Edwards continued to live at 266 Beacon. Hannah Edwards died in March of 1929, and Grace Edwards died in September of 1938. On December 5, 1940, 266 Beacon was acquired from Grace Edwards’s estate by Dr. Marius Nygaard Smith-Petersen, an orthopedic surgeon and pioneer in treating and repairing hip fractures. He and his wife, Hilda Whitney (Dickinson) Smith-Petersen, lived in Newton. In March of 1941, he applied for (and subsequently received) permission to convert the property into medical offices. He subsequently maintained his office at 266 Beacon. On December 30, 1941, Marius Smith-Petersen transferred 266 Beacon to himself, his wife, and their three children: Porter C. Smith=Petersen, Morton Smith-Petersen, and Hilda W. Smith-Petersen. Marius Smith-Petersen died in June of 1953. 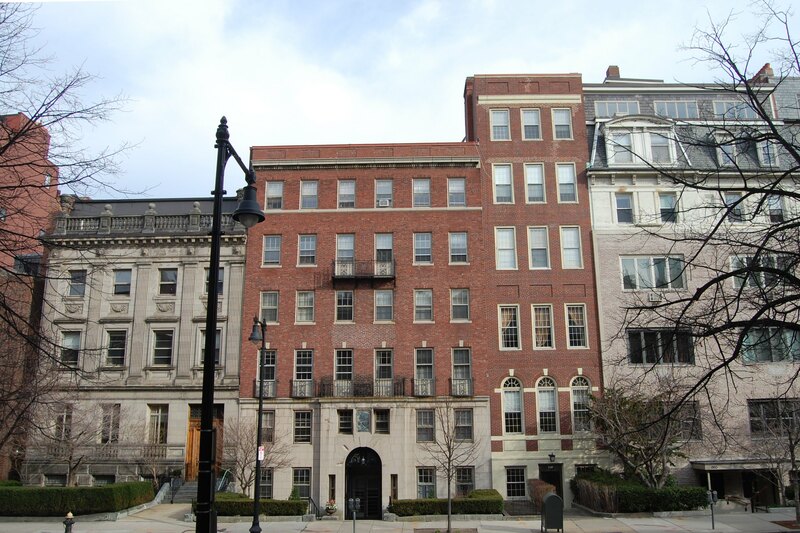 On April 28, 1972, 266 Beacon was acquired from Hilda (Dickenson) Smith-Petersen and her three children by M. Leonard Lewis of the Lordonie Realty Corporation. He also owned 262 Beacon and Lordonie Realty owned 264 Beacon. On March 18, 1987, M. Leonard Lewis transferred 262 Beacon to himself and his daughter, Barbara Lewis Rubin, as trustees of the 266 Beacon Street Trust. 266 Beacon remained medical offices in 2016.